If you haven't been following the St. Louis tea party for the past couple weeks, you've been missing an almost non-stop barrage of race-baiting, fearmongering designed to get people riled up about "scary black people" coming to change their way of life. It started with their obsessive focus on the New Black Panther Party, an obscure group that has about zero significance in national politics. The New Black Panther Party is clearly racist, but what's ridiculous about the tea party coverage is that they falsely claim that the Obama administration is not prosecuting a potential case of voter intimidation because the people involved were black, they are repeatedly, falsely implying that the decision to not file charges has to do with the fact that Obama and Eric Holder are black (for an example, see this video by Adam Sharp), they completely ignore the fact that similar and in fact more serious cases were not pursued by the Bush administration, and of course they are ridiculously over-exaggerating the significance of one incident with a group that has almost no members. After ranting on and on about the New Black Panther Party, the tea party seamlessly shifted into screaming accusations that the NAACP is racist by completely fabricating stories about them. And it's no surprise that Jim Gateway Pundit Hoft is leading the charge. Last year, Hoft linked to a story on the known white supremacist Council of Conservative Citizens website claiming that a Caucasian child was beat up by a group of black children (this was one week after there was video of a different case where a white child was punched in the face by a black child on a school bus). Despite the fact that no information was released about the race of the assailants, Hoft, following the lead of the racist website, declared that they were black. After being asked repeatedly in the comments, Hoft eventually moved the link to the White supremacist site to a different part of the blog. After still more complaints, he got rid of the 2nd link but kept up his video from the the racist youtube channel that featured other videos like, "Liberals chimpout after White Pride stickers appear," and "Jim Traficant talks about Jewish control of America." Of course, "we will not allow" is hardly a threat. It could mean simply "we're not going to let you get away with this without us saying something." But apparently Hoft is really pissed at the idea that a group of black people could "allow" him to do anything. A brief perusal of comments on this and other Hoft posts will find any number of commenters gleefully hoping for confrontations so they can try out the guns they've been stockpiling, as well as relishing the opportunity to call their adversaries "rodents" and "doormen". 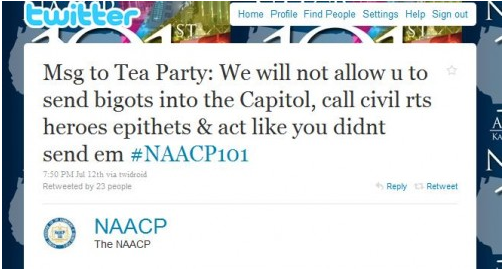 Yes, the St. Louis tea party has a racism problem. It may not be a simple as them using the n-word or making posters of Obama dressed as a witch doctor, but it's there nonetheless. Not to mention that there was a summary judgment on May 18, 2009 (http://www.slideshare.net/LegalDocs/findlaw-voting-rights-new-black-panther-party-figure-shabazzs-weapons-order) against the NBPP and Shabazz. Don't you love how the Teabaggerz (Dana's word) twist the facts?